It’s that time of the year when politicians start ramping up those television ads and candidates start declaring their intent to run for office. Yes folks, it’s election season here in the Philippines and the web has become another battleground and platform which politicians can utilize. As we saw in last year’s US Elections, the web was a way that candidates could connect with voters (albeit, they had someone handling their internet presence) and was a platform for them to disseminate information. Judging by the highly successful Obama campaign and website, it seems that candidates can no longer ignore the web as a emerging information platform. I personally enjoyed Obama’s campaign websites. It was very well designed, layed out, and provided a ton of information so I decided to find out what our own local politicians websites looked like. I found a list of websites for presidentiables here and started viewing them one by one. Scanning the list of websites, I found only two whose design stood out, which is quite sad given the number of presidentiables we have in this country. 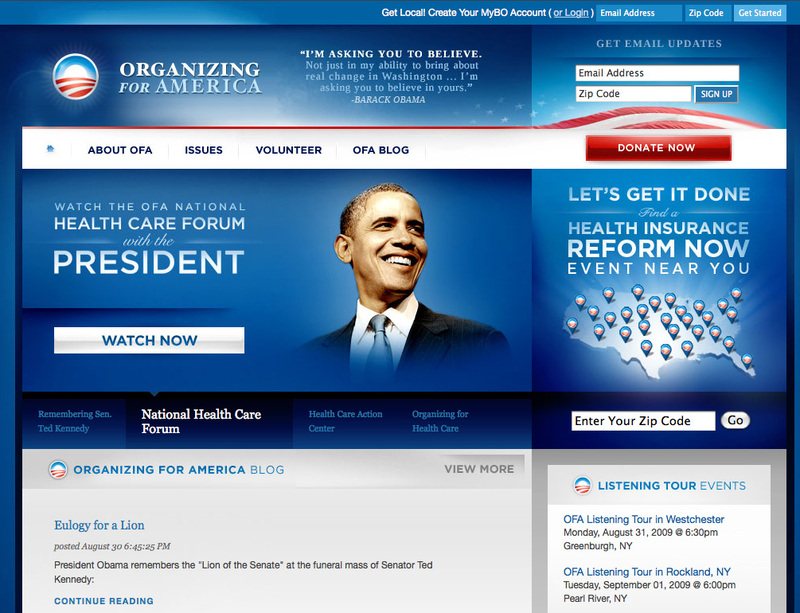 If I recall correctly, McCain’s website wasn’t badly designed, its just that Obama’s hit a home run. 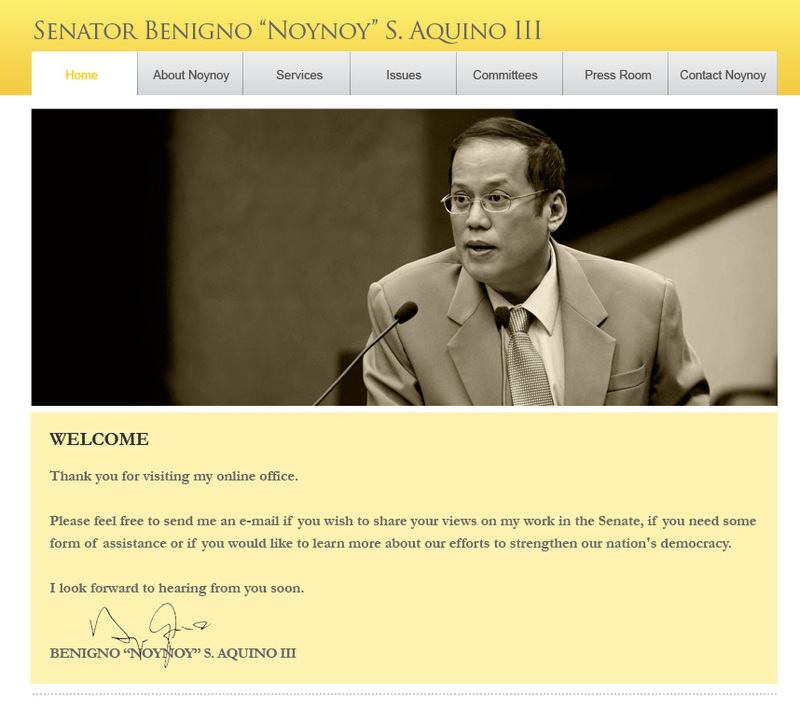 Senator Noynoy Aquino’s website is probably the best in the bunch. It’s clean, has a good color pallete (obviously yellowish), and uncluttered. It does have it’s problems though. The font is not tight and needs some work in which some pages have font sizes that look awkward. 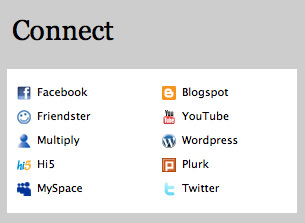 Also, he loses points for not having a favicon and having more than half his main navigation with broken links. Seriously, fix the links. 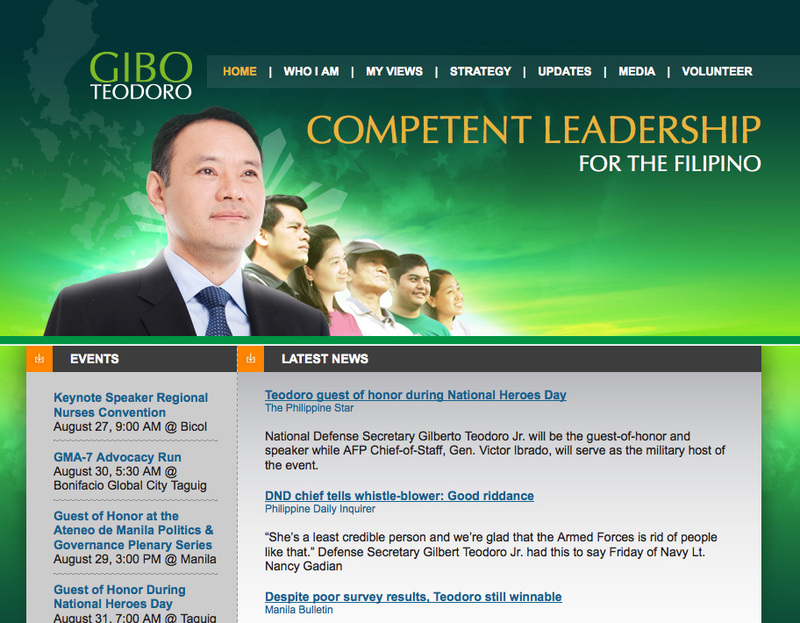 National Defense Secretary Gilberto Teodoro’s website is the other one that stood out to me. I enjoy the use of good colors, a modern layout and an appealing header (no matter how cheesy and stereotypical you may think it is, i like it). Unfortunately, I do not enjoy anything else. Again, the use of awkward font-sizes and font-color destroy the website. If the website were the first 400 pixels, this would be considered beautifully designed and well thought out. I also honestly though the text in the Latest News section were Google ads. In terms of the choice of technology and implementation of websites, I don’t know if we’re really have this sheer amount of backwards developers or people aren’t just reading and continuing to update themselves with the latest technology. I found a website that uses full flash (OK, he’s a vice-presidentiable but loading time was ridiculously long and good luck with SEO), two websites using *gasp* frames (for a reason I do not know), and almost all of them running on custom built CMS’s. There’s nothing wrong with Custom built CMS’s except that I don’t see much in their websites that warranted having to reinvent the wheel, which most likely means making a worse wheel. I did see some good stuff though. Senator Noynoy’s website cuts large pictures into smaller pieces for faster loading, a technique that mostly became irrelevant in the broadband age but at least it shows the developer knows his stuff. Erap’s website (for the sake of this article we will pretend he can run) is surprisingly running on Wordpress which for me is a very good choice. At the very least, I applaud our candidates for leveraging social technologies. In almost all of the websites, I found links to social accounts of the presidentiables. So if they can’t design well, at least they fulfill the goal of giving us, the voters, the proper information. If I may go back to Obama’s website for a second, there’s no denying the influence it has had on some of the developers and designers of our local candidate’s websites. One website follows the same layout and design elements (even the color, yes, I almost laughed) and another, refers to <candidate> everywhere, similar to, Obama everywhere, when referring to social networks. One of them uses a circle emblem on a line at the footer area similar to what Obama used to do with his branding, but that might be nit-picking on my part. Maybe it’s because I’m comparing our local websites with that of Obama’s during his campaign that I feel our very own are kind of lacking. If that’s the case, I hope that at the very least all of us Filipinos can utilize these websites to learn more about the candidates for the upcoming elections and be as informed as we can. And maybe, just maybe, they could move some of that enormous amount of campaign money and send it towards some very good local graphic studios, agencies, designers and developers. Which candidate’s website did you find well or badly designed? I am available for NEW PROJECTS. Click this to send me a message. You can receive my blog updates via email. Just enter your email address in the box below and click Go.